Diversity in professional sports is evident on the fields, courts and rinks across the country. Just don’t look for it in owner’s boxes. The media firestorm and outpouring of disgust that followed the broadcasting of Los Angeles Clippers owner Donald Sterling’s long-held racist beliefs is shining a spotlight on diversity within major league sports. The diversity on the field and the lack of it off. 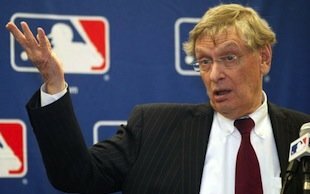 There are 153 teams among the six biggest professional major league sports in the United States and Canada: the National Football League (32 teams), the National Basketball Association (30 teams), Major League Baseball (30 teams), the National Hockey League (30 teams), Major League Soccer (19 teams) and the Women’s National Basketball Association (12 teams). Among these 153 teams, there is ONE Black majority owner. The Institute for Diversity and Ethics in Sport (TIDES), at the University of Central Florida’s College of Business Administration, keeps track of the diversity of players, coaches and assistant coaches, team management, league management and ownership by race, ethnicity and gender in several of the pro sports leagues. 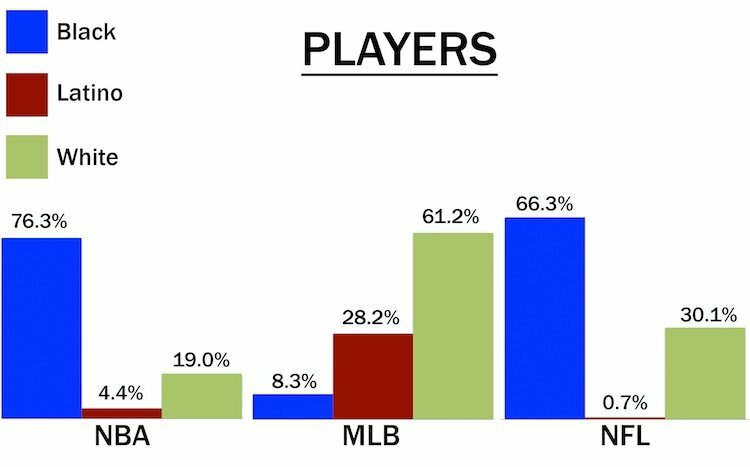 Their 2013 survey, which includes more than 4,000 professional athletes, finds only one major league sport where a majority of players are white: Major League Baseball (61.2 percent of players). Only Major League Soccer even comes close (47.7 percent). But when it comes to ownership, the diversity ends. NBA legend Michael Jordan, owner of the Charlotte Bobcats, is the only Black majority owner in any of the leagues. There are 23 other “people of color,” as defined by TIDES, that own some part of an NBA team, but none have a controlling stake in a team. These include five Black and two Latino business partners of Jordan’s in Charlotte, each owning a minority stake in the team. Famous minority owners also include actor Will Smith and his wife, Jada Pinkett-Smith (Philadelphia 76ers) and rap star Shawn “Jay Z” Carter (Brooklyn Nets). TIDES lists five Black owners in the WNBA, but all own a minority stake in their respective teams. In the NFL, the 2012 sale of the Jacksonville Jaguars to Pakistani-born American businessman Shahid Khan made Khan the league’s first and only nonwhite majority owner. The only Latino majority owner in professional sports is in MLB, where Arturo Moreno owns the Los Angeles Angels of Anaheim. Moreno is also the only majority owner in baseball who is a person of color, although longtime NBA star Magic Johnson (Los Angeles Dodgers) and Paxton Baker (Washington Nationals) do own minority stakes in their teams. Major League Soccer has perhaps the most diverse list of majority owners: Only 85.3 percent of people who control franchises are white. But none are Blacknearly 10 percent of owners are Latino, and the rest are Asian. 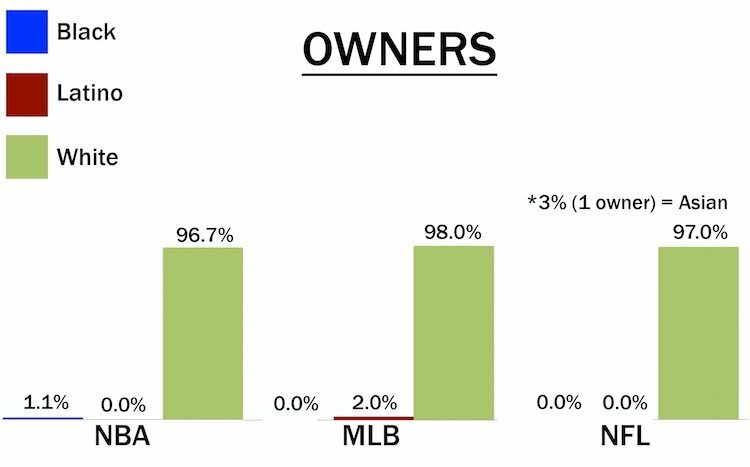 The ownership structure of MLSwhich is run as a single entityis also unique, as the owners are actually investors in the league as a whole, and have controlling rights over a particular franchise. Of the 30 NHL teams, Charles Wang, the Shanghai-born owner of the New York Islanders, is the only nonwhite owner.